The act of buying your first index tracker  is a big leap of faith (in yourself) and requires considerable courage. I’ve known a fair few would-be lion hearts who were all set to make the leap into DIY passive investing , only to back away because they weren’t sure how to implement their strategy in the real world. By the real world, of course, I mean the virtual world of execution-only online investment platforms  – because this is where DIY investors do our shopping. Read the first post in this series for a guide on how to buy index trackers . With thousands of funds available, not every investment platform will stock all the funds you want . If your heart’s set on a particular fund, then check your preferred platform carries it before signing up. Just grab the fund’s ISIN code from the fund provider’s website (you’ll find it on the fund fact sheet ) and stick it into the platform’s search engine to be sure they have it. UK online stockbrokers will usually offer most or all of the ETFs listed on the London Stock Exchange. If you want to trade say, US-listed ETFs, then call the broker directly to check availability. Other than fund choice, the main point of difference between execution-only investment platforms is the amount of fees they can dream up. I’ve asterisked the fees that you shouldn’t have to pay because there are good platforms out there that don’t levy those charges. Dealing fees will apply to ETFs, but they are easily avoided for index funds. If you’re an investors with less than £20,000 in assets and like to make monthly investment contributions, then choose a broker who charges a percentage platform fee but doesn’t charge dealing fees for funds. Some brokers will offer a batch of commission-free trades that may make their charges worth paying, if you’re active enough. Check that your platform’s list of charges includes VAT. Some do, some don’t. If you’re assets amount to more than £20,000, then it’s usually better to pay low-ish flat-fees than a percentage nibble of your assets that’ll grow into an almighty chomp as your investments grow over the years. 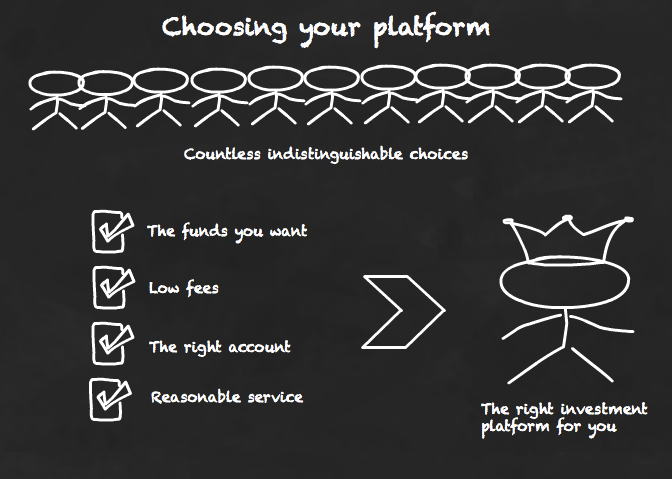 Most execution-only platforms offer several different flavours of investment account. It’s worth taking some time to select  the right one for your needs. Dealing or trading account – To hold investments held out of an ISA or SIPP  tax shelter. Regular investing accounts – Put your contributions on auto-pilot with a monthly direct debit. If you’re buying index funds then you shouldn’t have to pay dealing charges, but do look out for the minimum contribution required per fund. £25 is very good, £50 is standard. If you’re into ETFs then you can’t do better than regular dealing charges of £1.50 per purchase. ISA accounts – Wrap up your money in an ISA  tax repellent! You’ll typically want an ISA dealing account for long-term investing, but the new Lifetime ISA  that’s on its way could be worth considering if you’re young enough to qualify. There are Junior ISAs for children , too. SIPP  accounts – Choose your own pension funds. Note: The actual account terminology may differ, depending on the provider and the range of services they offer. Don’t be bamboozled. Once you’ve plumped for an account, it only remains to register it online, hook it up to a bank account, and prime it with cash for your first investment. Debit card payments, direct debits and BACS transfers are the standard ways of doing this. Service is important, of course. But I don’t sweat it for a few reasons. There is little to choose between the different platforms in my experience when it comes to service, from the perspective of a hands-off passive investor. Pick any company and you can always find horror stories from ‘Outraged of the Forum’ but that way can lie analysis-paralysis. You can also out the hundreds of comments beneath our broker comparison table  for any recent talk of problems. In practice, online investment platforms offer about the same level of service, diversity, and complexity you might expect from an online bank account. If you can operate one of those and you understand the principles of investing, then you’re in business. Bear in mind that we passive investors are relatively low maintenance and have little need for the gold-plated services demanded by the more shrill voices online. It’s ultimately a matter of priorities. One company with a superior reputation for customer service is Hargreaves Lansdown  – but it’s far from the cheapest option. If you feel you truly need that reassurance then go for it, but remember that small costs really add up  over the long-term when investing.